Years of experience have come together in the design and implementation of a fan shroud assembly that seals tightly and integrally as a bespoke fit to our KryoFlow series radiators to provide the best overall cooling results we've ever seen in conversion Jeeps. Well-shrouded fans create 40%-50% more flow through a radiator than similar non-shrouded fans, we knew that a tight-fitting, low-profile shroud would be the most effective design of all because it cups much more of the radiator's surface area and then focuses the air's exit path into a tighter area, creating greater velocities whether the airflow is active (fan switched on) or passive (fan switched off at higher vehicle speeds). 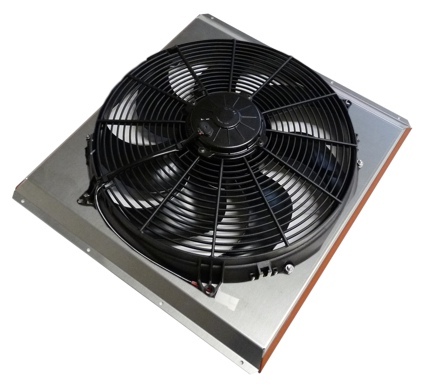 Behind that, we've attached a powerful world class SPAL® fan to pull a constant large volume of air through the radiator ensuring optimal cooling. The shrouds feature baffle doors to allow high speed air to pass at freeway speeds but are pulled closed sealing off when the fan is running at lower speeds to ensure optimal cooling at all times. 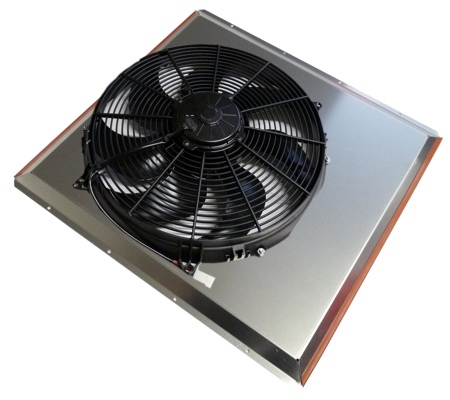 Applications are listed with each model and are designed as a bespoke fit for its intended radiator. These are not a universal fit shroud and do not fit perfectly for each model radiator. Other components below are generally of a more universal nature. If ordered with its matching radiator, there will be no installation as it will be installed for you to the radiator and go in as an assembly. Installation of the shroud to our radiators requires a rivet gun and drill with #11bit to install 3/16” rivets. To remove the fan you would need a 7/16” wrench or socket. 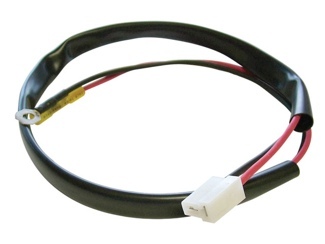 Electrical connections can be made with either crimp or solder connections. 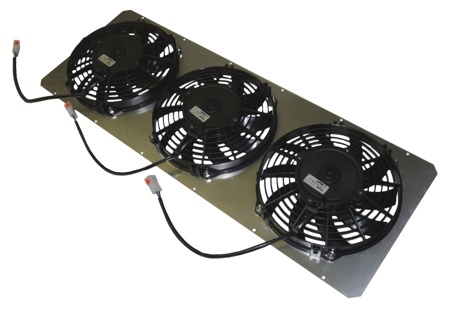 Fans can draw considerable amperage so if using your own wiring be sure it is an adequate size. Of course the entire usual attorney recommended safety warnings apply to wearing safety glasses, and other safety attire. If using a late model fuel injected engine we recommend having the ECM control the fan through a relay. 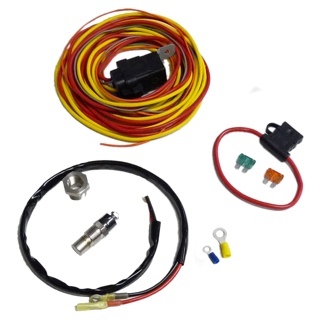 Our own Engine control harnesses are made that way with extremely heavy duty 70amp relays. If you don’t have the ECM control, the fan control kit above works exceptionally well or you can supply your own circuit. Just ensure that it is up to the task for the amp draw load. Some users have installed a bypass switch to allow the fan to be turned off manually if necessary such as a deep water crossing. With lesser, fine bladed fans we have found that to be a problem. 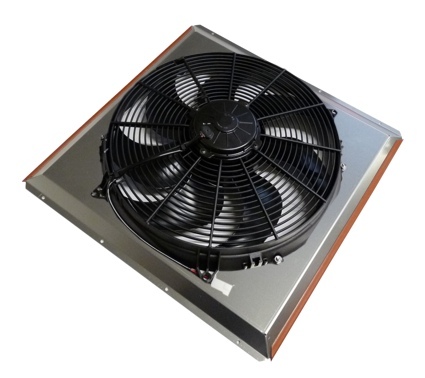 To date we have not had a failure of one of these SPAL heavy blade fans from that issue.